Life is busy, and planning your kids’ parties shouldn’t make it more difficult. Let’s find out together if the projects you want to try are really worth your time. Read more in this monthly recap of our family’s busy March. Wow, what a month. It somehow feels like March was a test of my perseverance and will. Though, I’m not exactly sure who won and who lost. The only snowstorm of the season wasn’t much, but it was enough to close school for the day and kill the early buds on our hydrangea. I’m still a little heartbroken about the last one. The Husband went on a 7-day business trip. On the very first day, my car died right outside of gymnastics class. Thank goodness for having awesome neighbors that can come help in a pinch. No less than 5 doctors visits for the kids, with at least 3 more in the works. We started prepping for the next One Room Challenge. It’s going to be a TON of work, but I can’t wait to see the end results. Two other very big, long-term projects started. Both are so exciting, and I can’t wait to share more. I turned yet another year older. So if I haven’t been around to visit your blogs much lately, now you know why. But I’ll be back around in good time. Please trust me on this. I sorely miss visiting your posts on a regular basis. Here’s a bit more about what’s been going on in our lives. Last month I promised to be stronger, healthier, and more productive. After that laundry list of stressors above, you probably figured by now that I didn’t make it to the gym at all during the month. But wearing my new Fitbit Charge II has definitely helped. I really do need that hourly reminder to move sometimes. A year ago, getting to 10,000 steps each day wasn’t much of a challenge. But doing so much work on the computer lately, means that I’m now only averaging a measly 6,500 to 7,000 steps during my 18-hour days. March also brought the start of Lent. And this is the second year I’m attempting a fast from all junk food. That means no cookies, candies, cakes, crackers, chips, or pretty much any snack food you can think of. It’s easier this year than it was last time, though I’m starting to feel like wavering. Only 16 days left! You never really know how much you need someone until they’re gone. And while the kids and I managed pretty well while the Husband was on his trip, we all clearly missed him very much. The baby especially seems to want the Husband around more now. It’s both sweet and sad to see him get so upset whenever the Husband leaves even to go run a quick errand. Turning one year closer to 40 also seems to bring out the sarcasm in my family. There are always at least one or two who seem to feel a need to make fun of growing older, but also forget that I’m the youngest. Tip: Don’t make a joke about someone’s age when it can be thrown right back in your face. Getting older isn’t bothering me (yet). Perhaps it will next year. Reading definitely took a back seat this month. Though I did get to finish one novel. This book was my least favorite of all reads so far. Most of the characters were wholly unlikeable. The main character and those around her were all far too arrogant to be relatable. The storyline was too disjointed to follow along easily. Without giving away too much, I will say that the book tried to end on a positive note, but it felt too thrown together and didn’t didn’t do enough make up for the disrespectful and closed-minded attitudes of the characters throughout. A new take on content. You may have noticed that several of the latest tutorials have followed a slightly different format. I’m just now implementing some of the takeaways that I learned so many years ago when I tested out the idea of starting an event design business. It feels good to finally put into action an idea that’s been rolling around in my head for the last 5 years. It’s another one of those BIG, long-term projects that will take quite a bit of tweaking along the way. Feel free to let me know if you have any recipes or party decor projects that you love, but feel intimidated to try. Let’s find out together if those projects are really worth your time. Speaking of event design, did you see my post on classic Disney-themed parties at Jenerally Informed yesterday? Looking at so many beautiful kid’s parties out there is one of the reasons I started this blog. Yet, I know all too well how that inspiration can quickly become overwhelming and intimidating. One of my goals is to show how any parent can create a memorable birthday for their child without breaking their spirit or their bank. 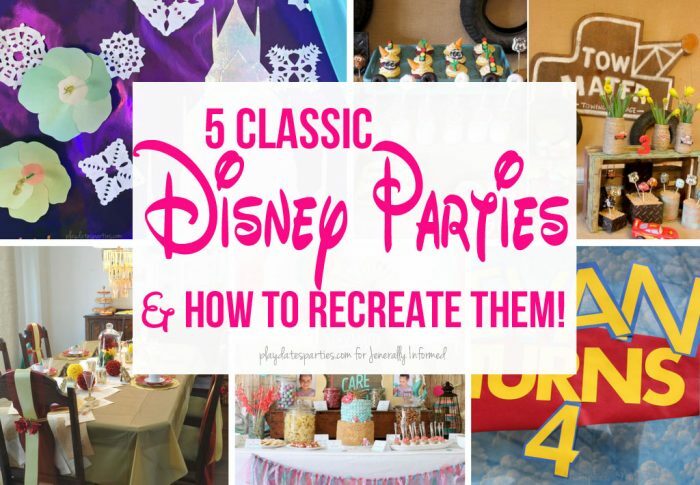 Yesterday, I shared how to do just that with five classic Disney party themes. Tell me, are there any party crafts or recipes you love, but are afraid to try? What’s your biggest frustration with planning parties for your kids? My husband just got back from a 5-night trip, and man – am I grateful he’s back! He’s the family chef/lunch-maker/trash-remover/grocery-shopper so it was a bit of an adjustment to our routine while he was gone. Even the dog was a bit thrown off! Glad things are back to normal and can’t wait to see your One Room Challenge! Wow! What a month! I’m sorry it’s been so hectic/stressful. I’m excited to see what your big, upcoming projects are though! Good for you for giving up junk food. I don’t think I would have the willpower, although I know it would be hugely beneficial. I hope April brings less doctors appointments and less stress! Leslie you are the ultimate party guru! Those long term goals can seem so very long term right, but when that one comes to fruition, you are going to be great!! I love the quote. That is so true! I need to keep that pinned somewhere. Busy month you had! I’m glad your husband is back – that’s sad the baby gets so upset! I hope that April is a much better month for all of you! I love planning parties and doing crafts but I haven’t done much lately. Sigh. You had one busy month. Sick kiddos is a bust especially when they can’t tell you what’s wrong. Good neighbors are always a blessing. I have always been blessed in that manner.